L1544 is known as a pre-protostellar core (Taffala et al 1998). 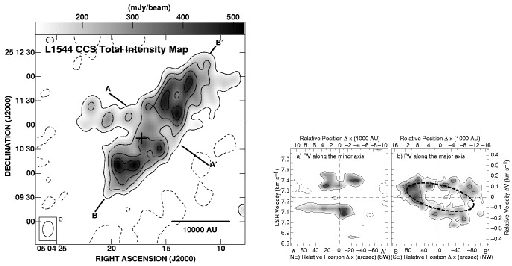 That shows an infall motion but this contains no IR protostars. In Figure 1.18(left), CCS total column density map is shown, which shows an elongated structure. Ohashi et al (1999) have found both rotation and infall motion in the cloud. Position-velocity (PV) diagram along the minor axis shows the infall motion. That along the major axis indicates a rotational motion, which is shown by a velocity gradient. Due to a finite size of the beam, a contraction motion is also shown in the PV diagram along the major axis. Figure 1.18: CCS image of prestellar core L1544. (Left:) Total intensity map. (Right:) PV diagrams along the minor axis (left) and along the major axis (right).